No plan. No backup. No choice. Agent Ethan Hunt and his elite team go underground after a bombing of the Kremlin implicates the IMF as international terrorists. While trying to clear the agency’s name, the team uncovers a plot to start a nuclear war. Now, to save the world, they must use every high-tech trick in the book. The mission has never been more real, more dangerous or more impossible. 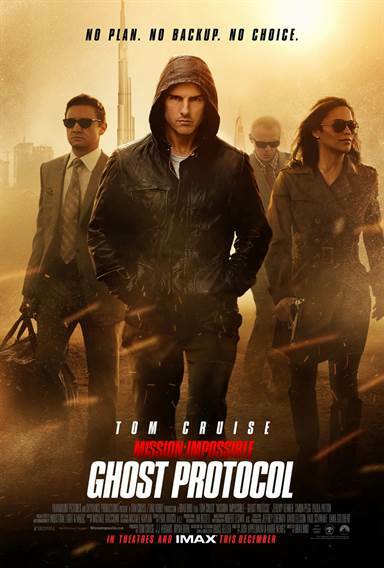 Download Mission: Impossible Ghost Protocol in Digital HD from the iTunes store. Mission: Impossible Ghost Protocol images are © Paramount Pictures. All Rights Reserved. Some day Tom Cruise will be too old to reprise Ethan Hunt, the Team Leader for the Impossible Mission Force. I wondered if the 49-year-old Cruise was there already; but there was no need to wonder! The guy has the body of a completely ripped 25-year-old. I am not sure how that is possible; but unless it is CGI, what we see on screen is a person in peak physical condition – which is good because Cruise brings a charisma to the role that makes it clear why he is the super-star he is. The story is the fourth installment of the Mission Impossible series. Tom Cruise is a secret government agent who takes on missions that are all but impossible. They are assigned by "The Secretary" (played by Tom Wilkinson) -- "should he choose to accept them", and the electronic mission briefings all self destruct five seconds after being delivered. This is also the live action directorial debut of Brad Bird who made his name on Pixar films, e.g. Toy Story 3, the Incredibles, and Up. He is a talented director, and Mission Impossible 4 is a perfect fit for his formula of having a daring, physically dangerous plan that the characters must undertake and then have everything possible go wrong as they try to do it. He ratchets up the tension with a pitch-perfect action sequence that involves Cruise trying to climb the highest building in the world while using dodgy, "sticky gloves". An analyst gives him an annoying count-down as the time to failure quickly runs out. The scene was filmed using IMAX cameras for the view that would not only show the street below, but the bend in the window. Bird wisely avoided 3D in favor of the bright, crystal-clear picture that really is more immersive than a faked perspective. Although you 'know' Cruise isn't going to die, Bird's talent makes you wonder. As Cruise did the stunts for that scene himself (and you can see it is him) it makes the sequence one of the all-time bests. The story itself is a pretty standard, super-spy boiler plate. There are nuclear weapons, Russian agents chasing our heroes, questionable arms dealers, exotic locations, beautiful women, false identities, and super-gadgets. It is definitely in the "super spy" genre rather than the more realistic and gritty world of Bourne or the recent Bonds. The term "Ghost Protocol" refers to what happens when your secret mission force gets entirely disavowed by the government, and they have to "go rogue" without any support from the home base. The IMF team here is well chosen. Simon Pegg brings much needed levity to the movie with its understated but excellent comedic timing; and as an inexperienced character, he provides a good foil to have some things explained while giving us running dialog that keeps it from being all silence as we watch these experts work. Paula Patton is the bombshell member of the team who, thankfully, gets a fair amount to do and is extremely competent if not quite up to Cruise's level. Jeremy Renner plays Brandt, a desk analyst who gets caught up in the action unexpectedly. He is also going to be the new Bourne, so he has some physicality that he brings to the role when it calls for it. Over all, Ghost Protocol is not a surprising movie. It does not subvert its formulas nor stun its audience. It builds tension through craft. It knows what it needs to do and does it relentlessly. For example, it understands that Cruise must sprint for much of the movie, and yes, we get to see Cruise sprint ... and sprint ... and sprint. I am not sure why we need to see Cruise sprint, but it seems to be a selling point since at least "The Firm". At 133 minutes, it is unafraid to pile on the plot-twists or to have a last-ditch attempt go on and on. If it risks wearing out its welcome, it is the competence of the director that brings it back. Ghost Protocol is not so much "smart" in its plot as it is intelligent in its construction and execution. It is a loud, bright, summer movie that elicited audience applause at the end in the theater. It is the must see movie of the summer, and the best Mission Impossible yet. Does Cruise still have it? He does! Do the missions get any harder? They better not. Go see it! Mission: Impossible Ghost Protocol images © Paramount Pictures. All Rights Reserved.